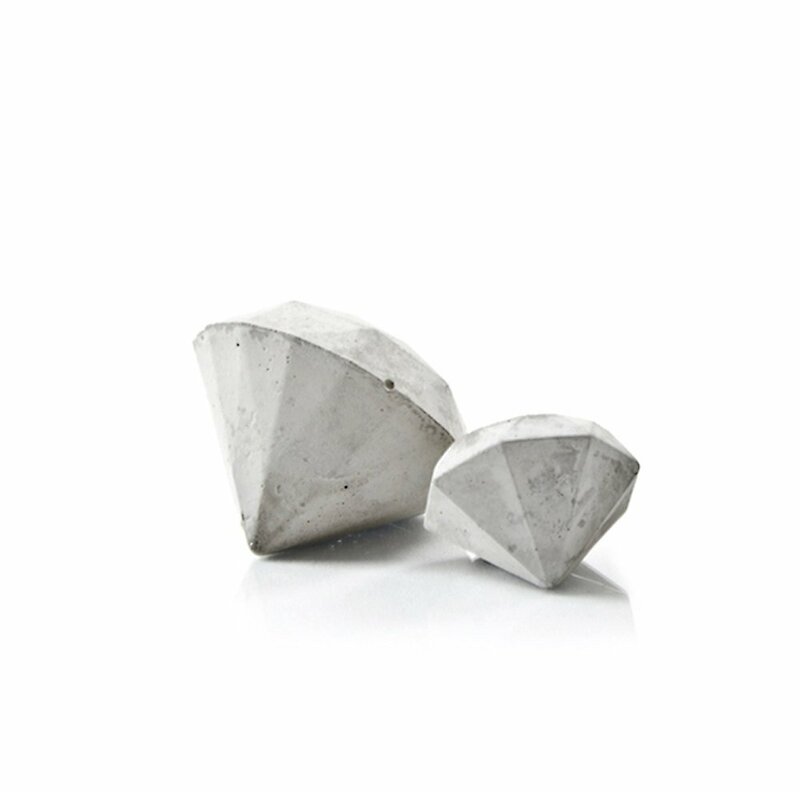 The wonderful geometric shape of a classic diamond, and if you like two variations, individually hand cast from concrete. 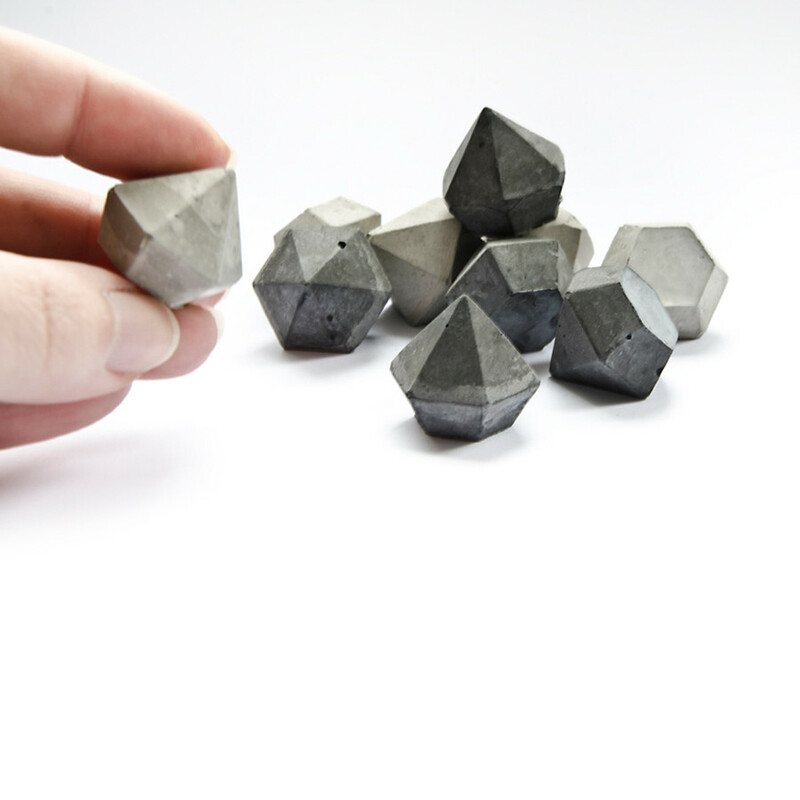 Each diamond sculpture solid finishes uniquely due to the nature of the material and will have an individual grey shade as well as imperfections. 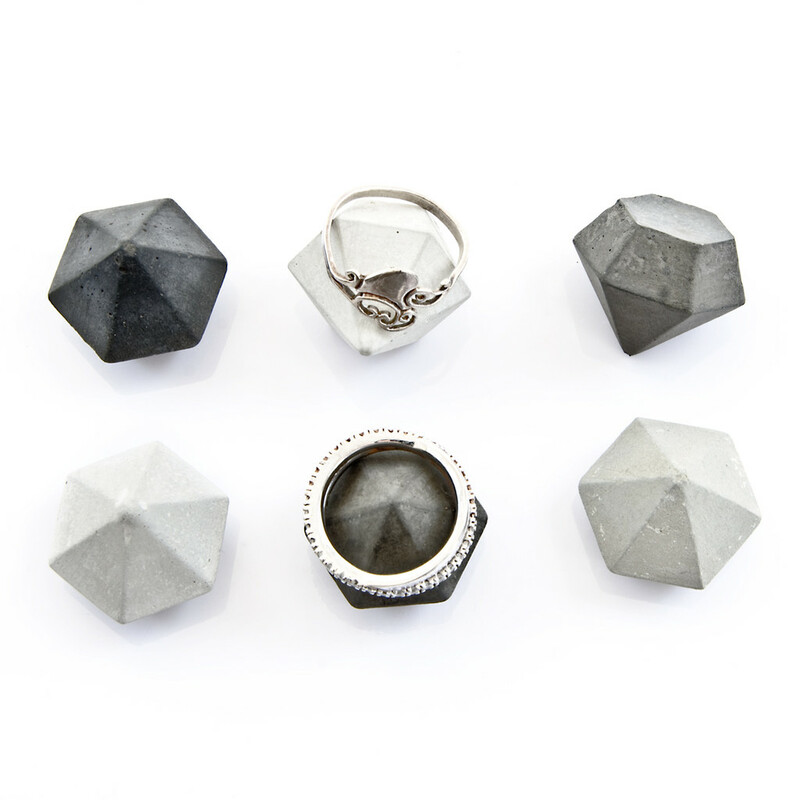 The smaller rounder shapes are wonderfully tactile accessories and make cute ring holders while the large one is a great paperweight but could also hold your bracelets. 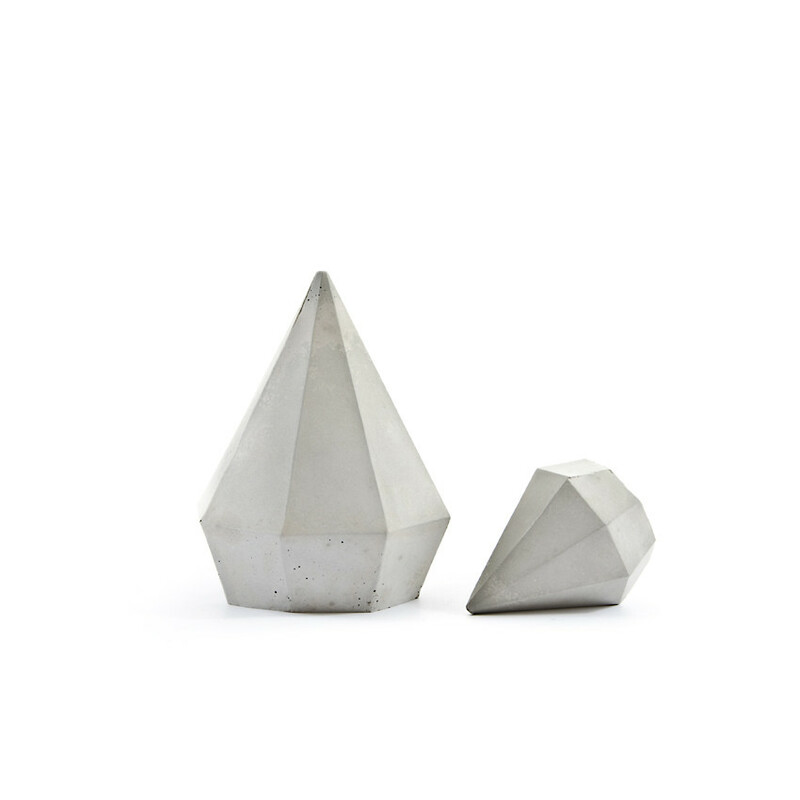 So it will be up to you if you display them as wonderful minimal modern sculptures on a sideboard or shelf, on a coffee or bedside table or utilise them. 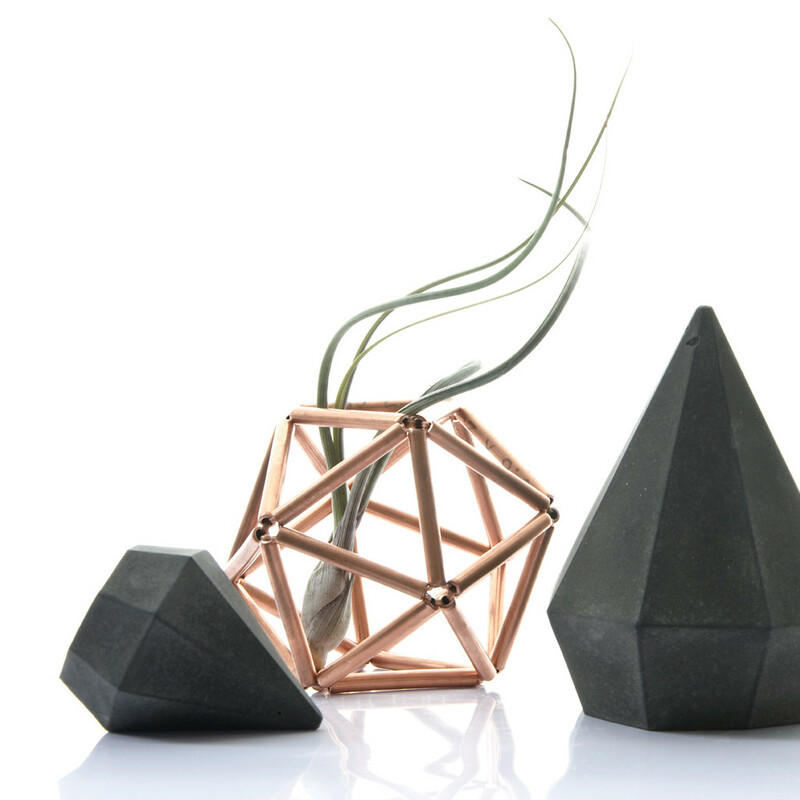 One thing is for sure these are not just eye-catching but also wonderful gifts. 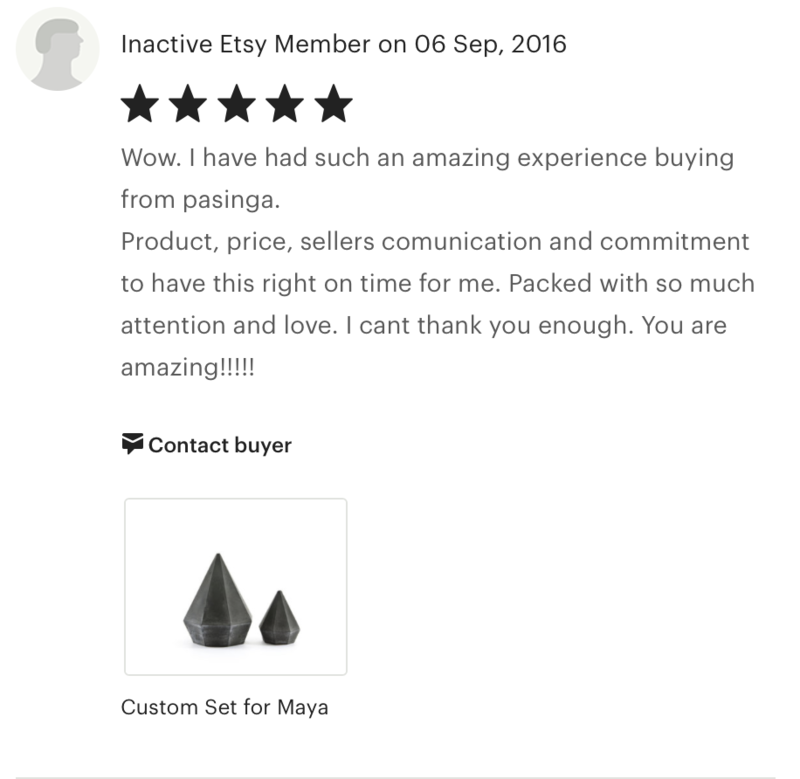 For customisable options just have a look further below on this page! small diamond H2.5 x W3.5 x D3.5cm. 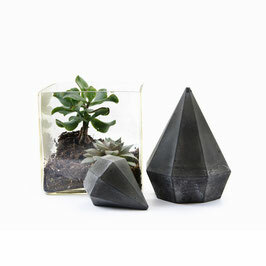 Design: geometric minimal; each size features a different design; hand cast. Features: unique textures (voids and cracks) and colour character. 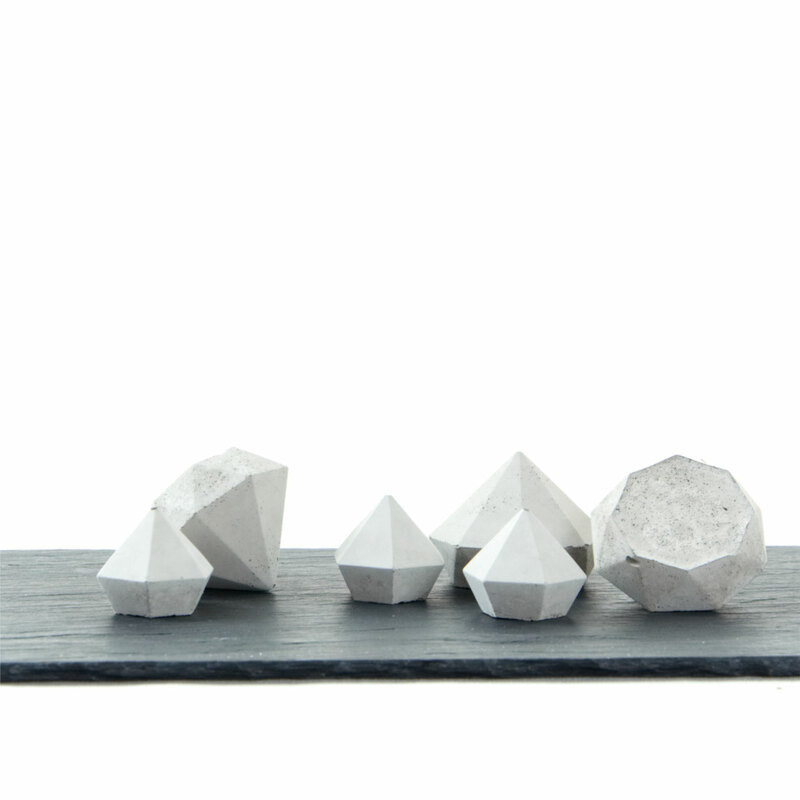 Finish: concrete not painted or waxed; large wide diamond sculpture is individually stamped with my artist name. 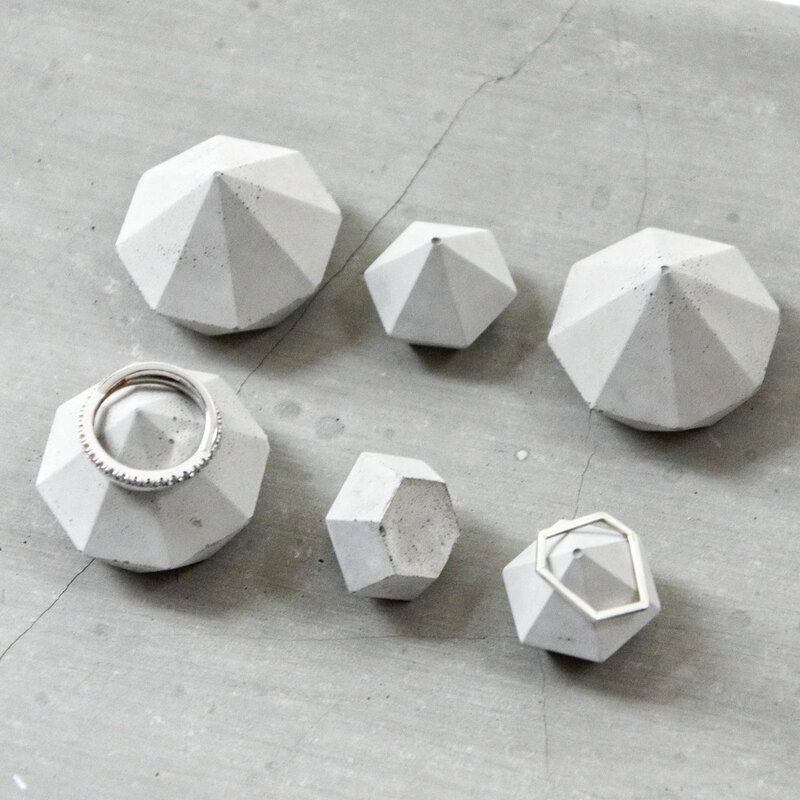 This minimalist tall diamond design is made from concrete. 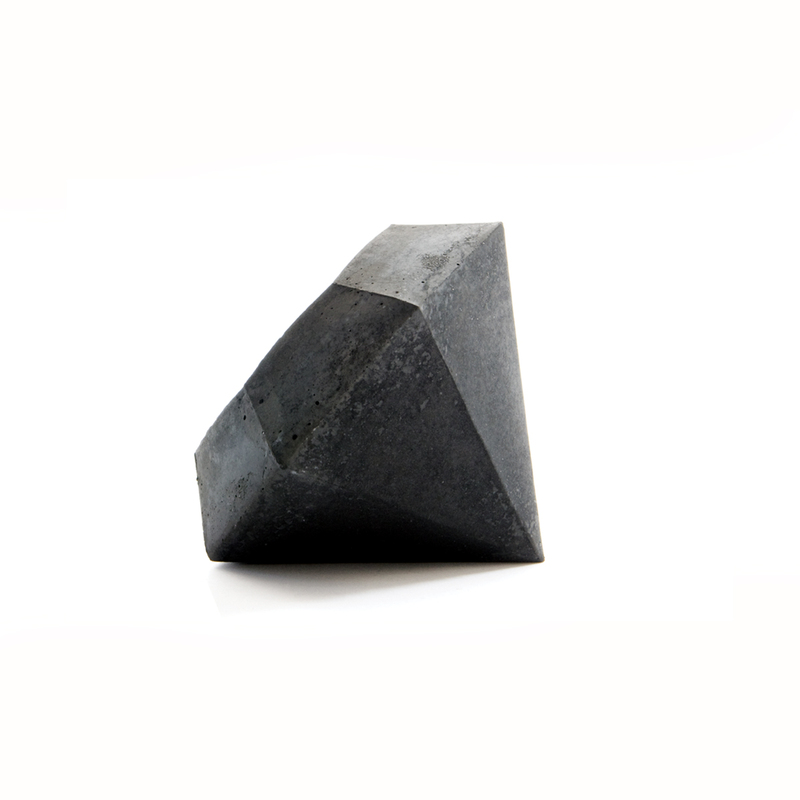 This modern edgy industrial sculpture is inspired by the timelessness and elegance of a diamond. Presented on their own a bold statement of simplicity. 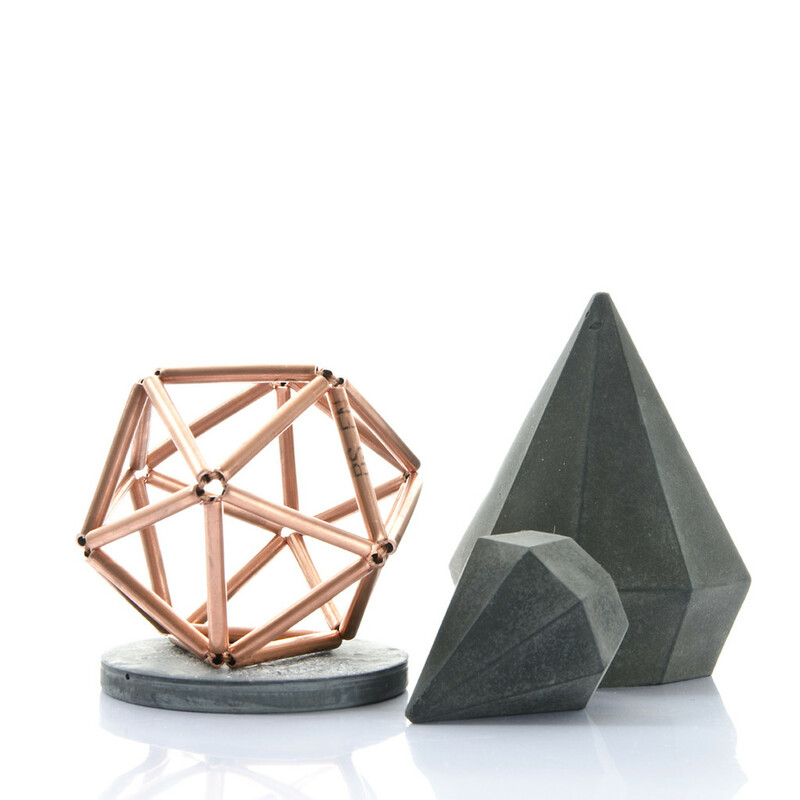 Feature them between your favourite books, photographs or collectables, place them in a terrarium or under a glass dome to display it centre stage in your display. 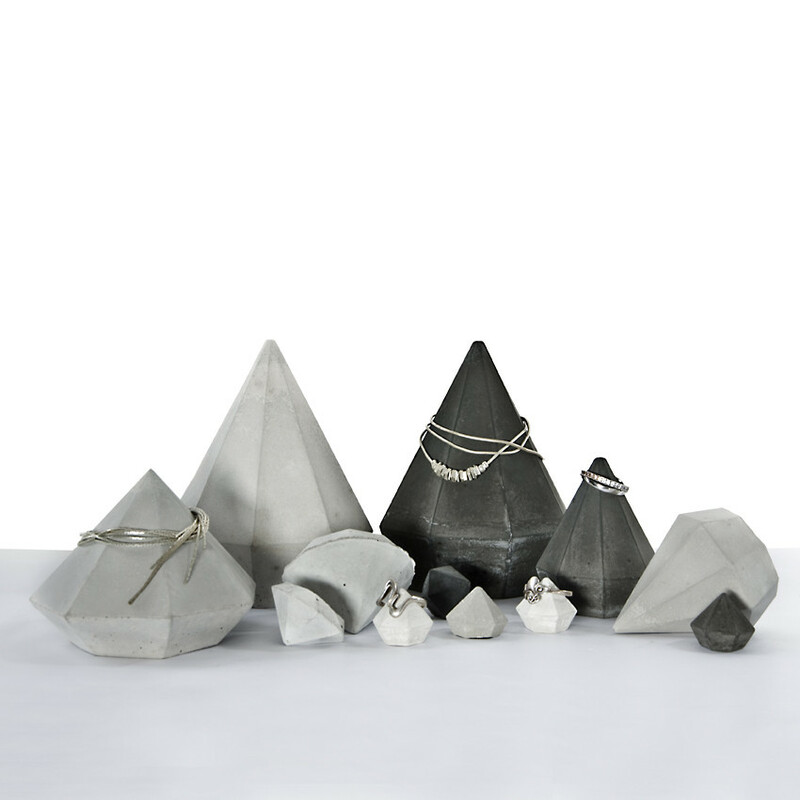 The small size will be wonderful for a statement ring while the large size will also display bracelets or watches. They are extraordinary, not just because each is one of a kind due to the material. Each concrete diamond is individually hand-crafted, features eight sides and is finished with smooth corners and a rounded tip. psst .. more designs and sizes above and below, enjoy! Approx. 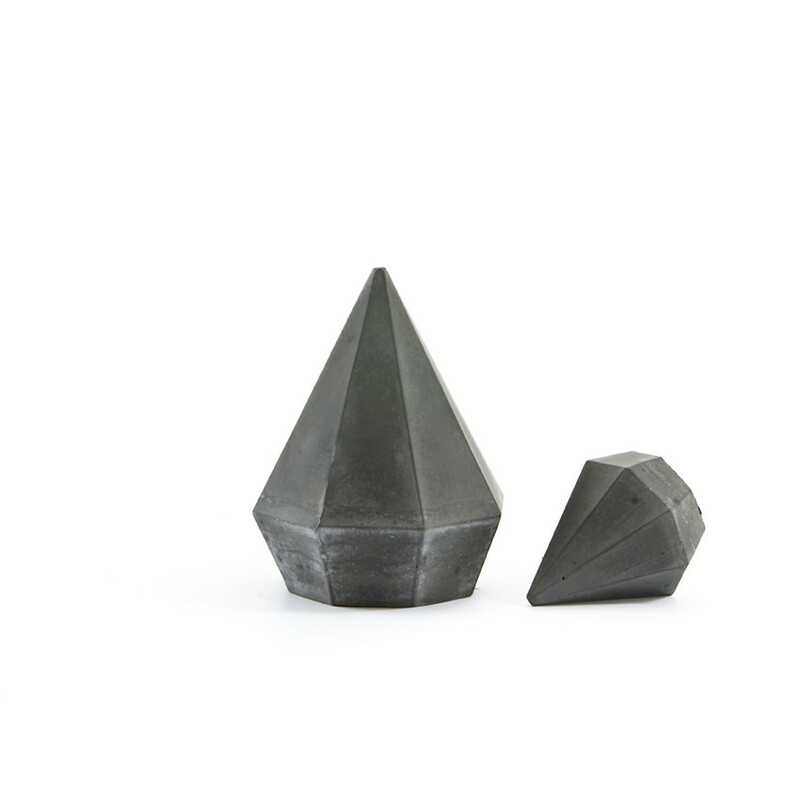 size: large tall diamond H13 xW10 xD10cm, small tall diamond H8 xW6 xD6cm. 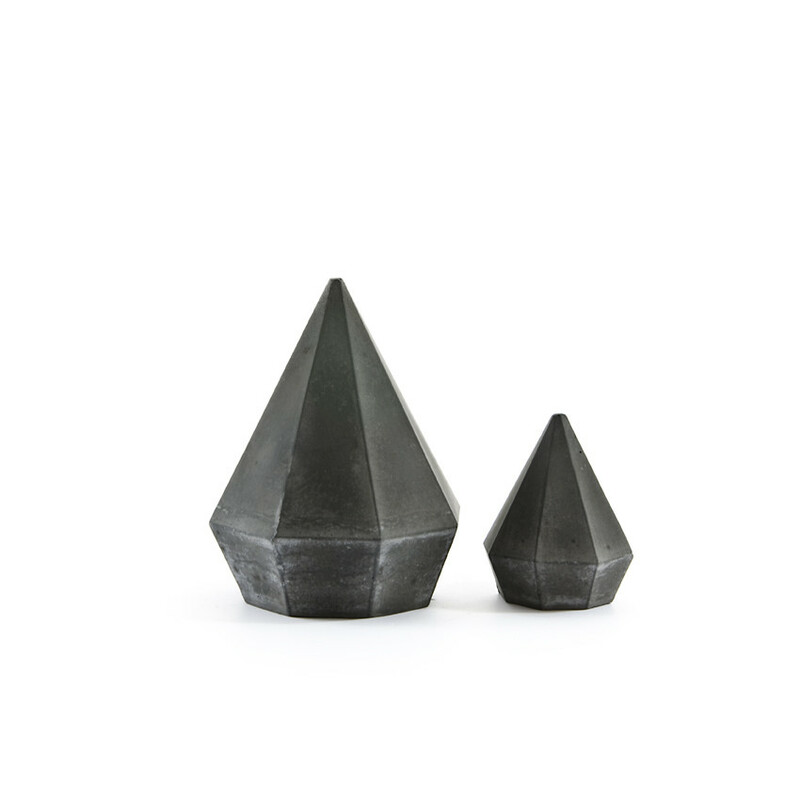 Colour: mid to pale grey or charcoal to dark grey concrete. Design: geometric minimal; individually hand cast in handcrafted moulds. Finish: concrete not painted or waxed; individually hand stamped with my name on base side. 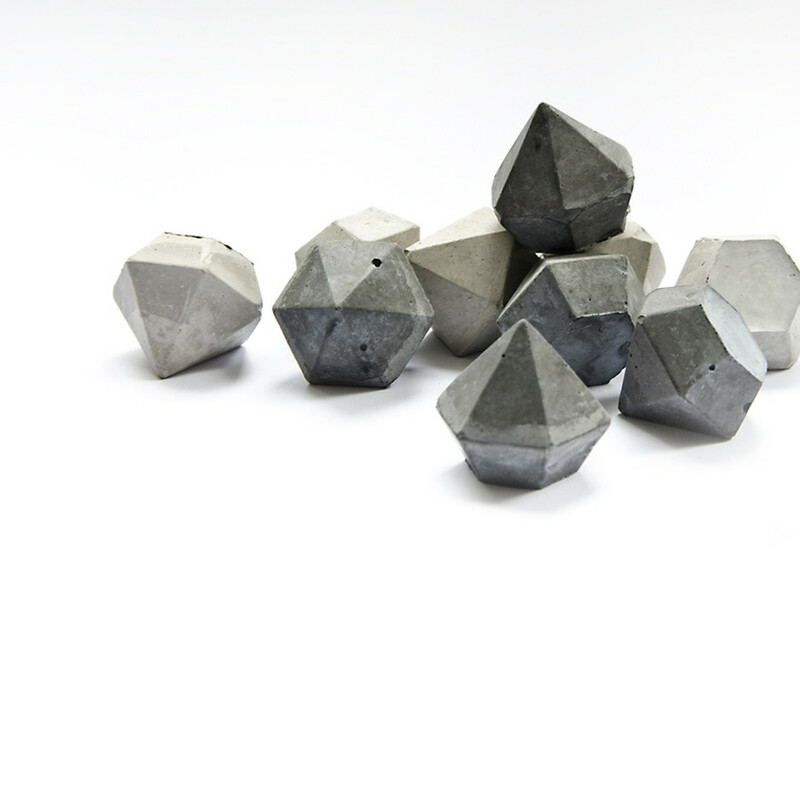 A delightful set of six mini concrete diamonds in pale grey or black pigmented concrete. 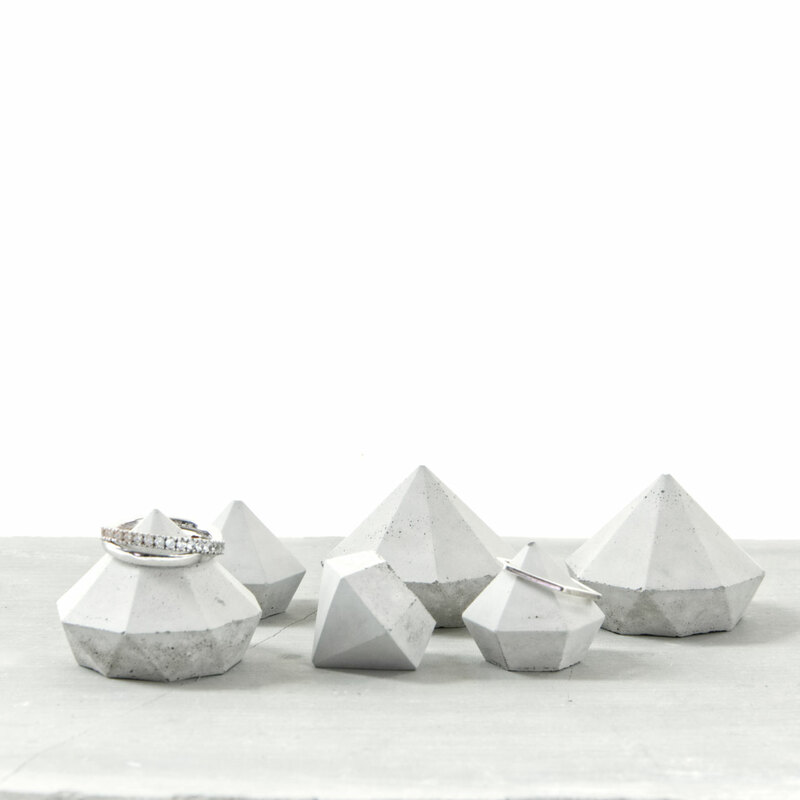 Diamonds are a girl's best friend and this set of six small concrete diamonds make the perfect accessory on your dressing or bedside table as ring holders. 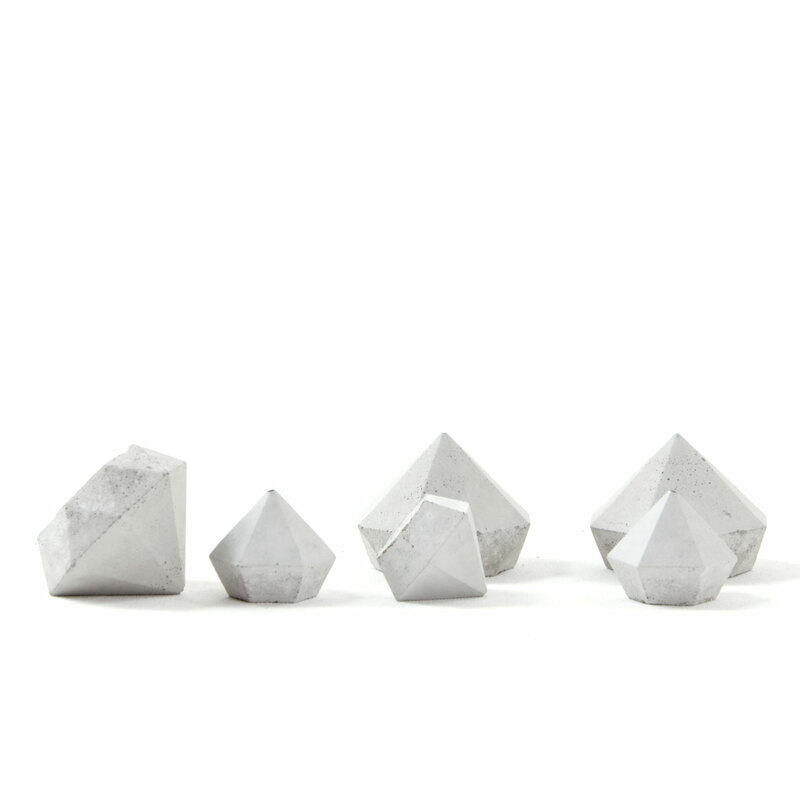 They are also a cute gift or could just be a wonderful eye-catcher when placed on their own or between your favourite pieces within a tablescape. 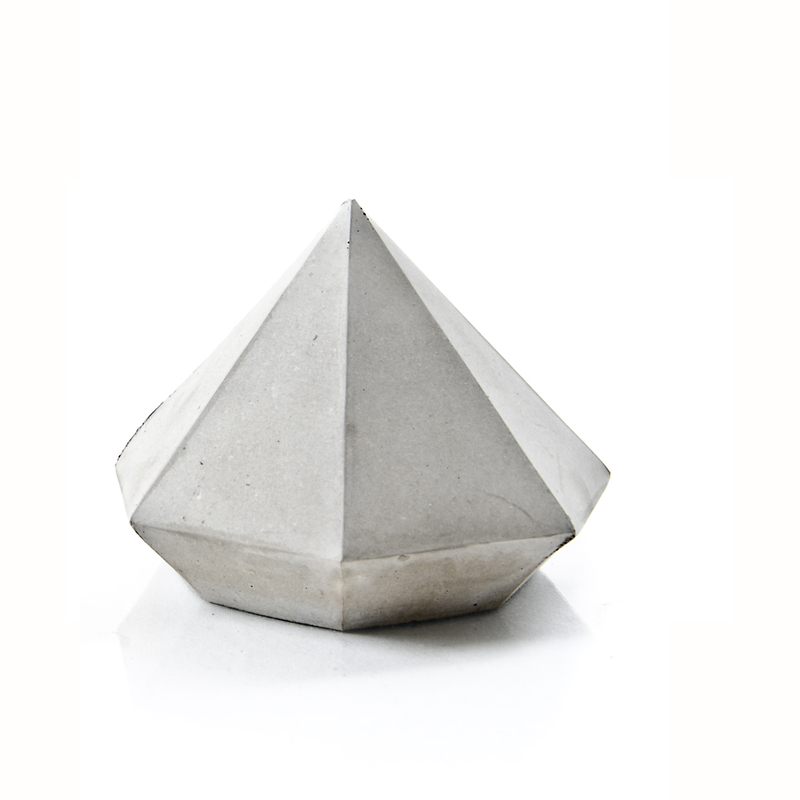 Each concrete diamond is one of a kind due to the material and individual crafting process. Larger and different designs are above and below on this page, enjoy. 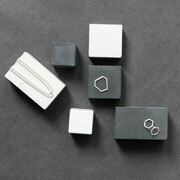 Set of Six Small Concrete Diamonds - all pale or dark grey or a mix, please choose below, thank you! Dimensions: Approx. size: H 2.5 x W 2.5 x D 2.5 cm. 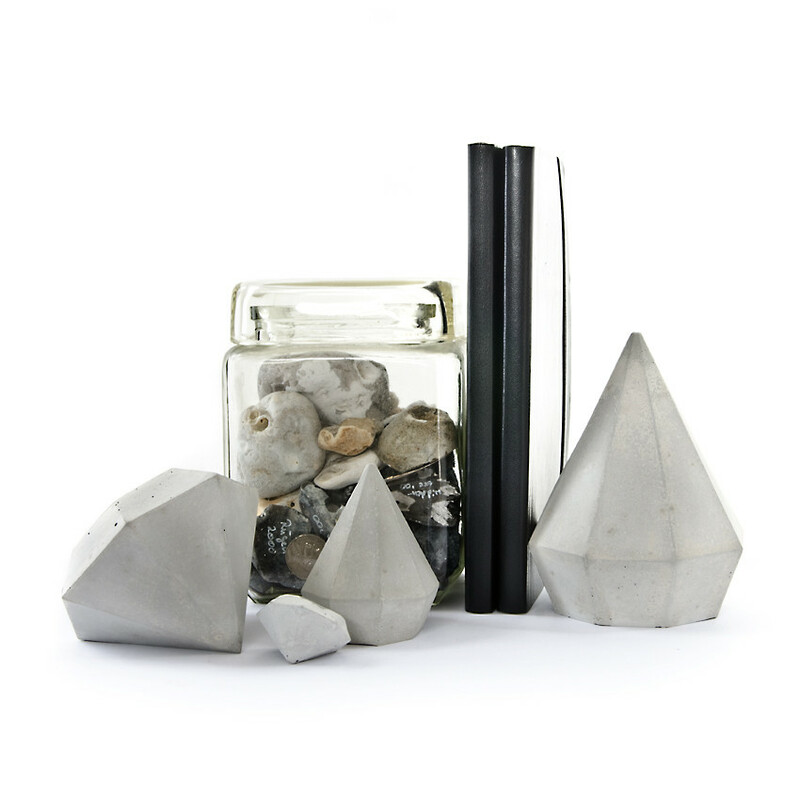 Colour: mid to pale grey or / and charcoal to dark grey concrete. 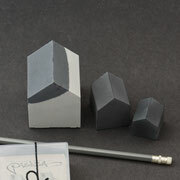 Design: geometric minimal; each size features a different design; individually hand cars. 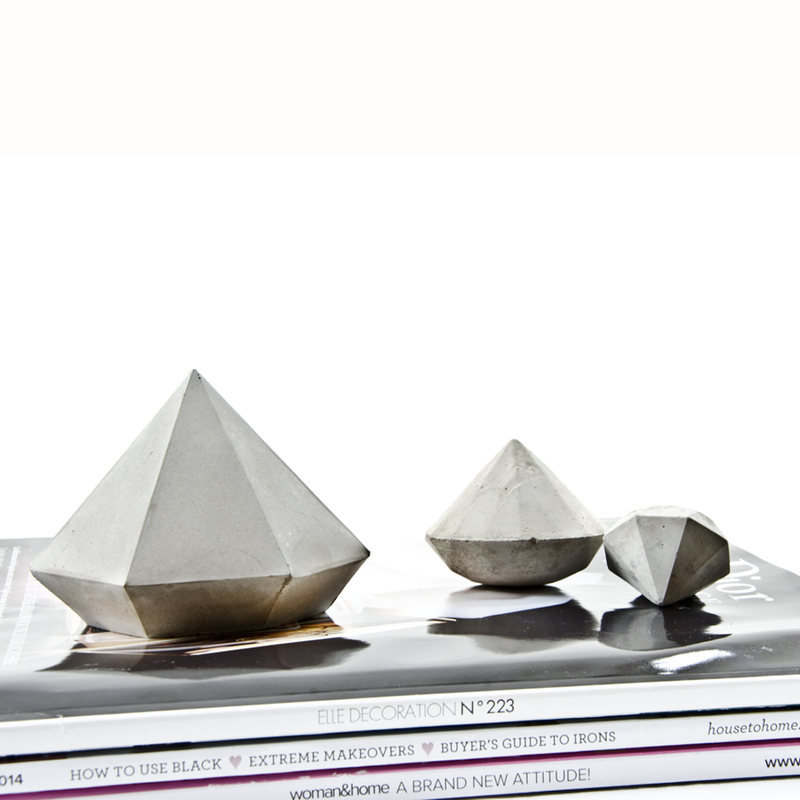 An elegant concrete diamond mix utilised as ring stands or a playful sculpture still. This set features two designs in a wonderful pale grey and are finished very smooth. 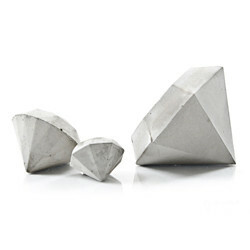 The simpler smaller variation is a timeless delight and the more faceted larger design draws attention, both will allow the display of many ring sizes and designs. 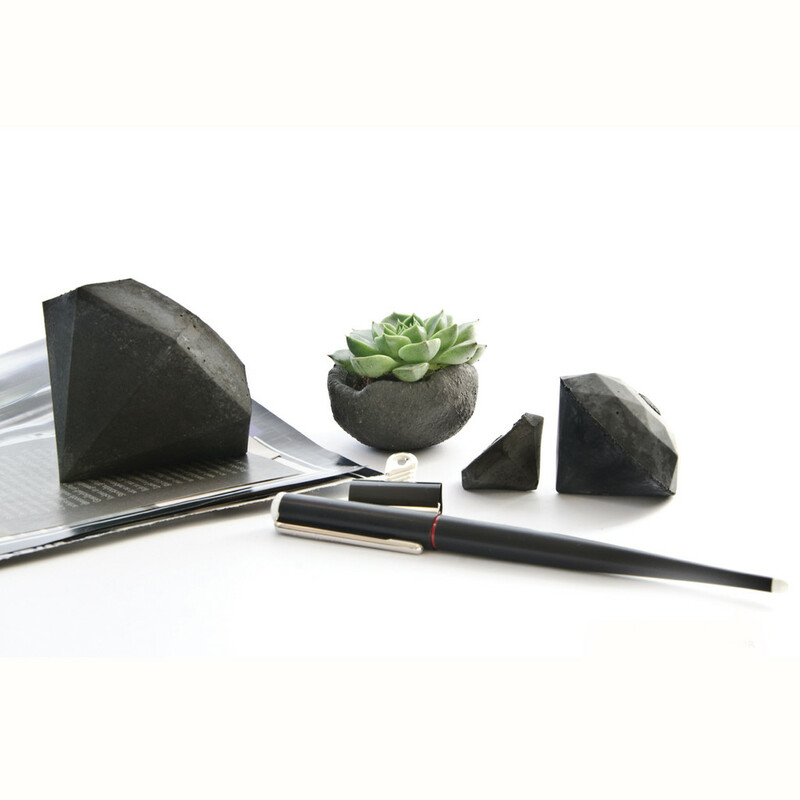 They are not very heavy and will allow a quick an easy set up for market fairs, exhibitions but can also be displayed in various ways for window or retail displays. psst... have a look above and below for more designs, enjoy! 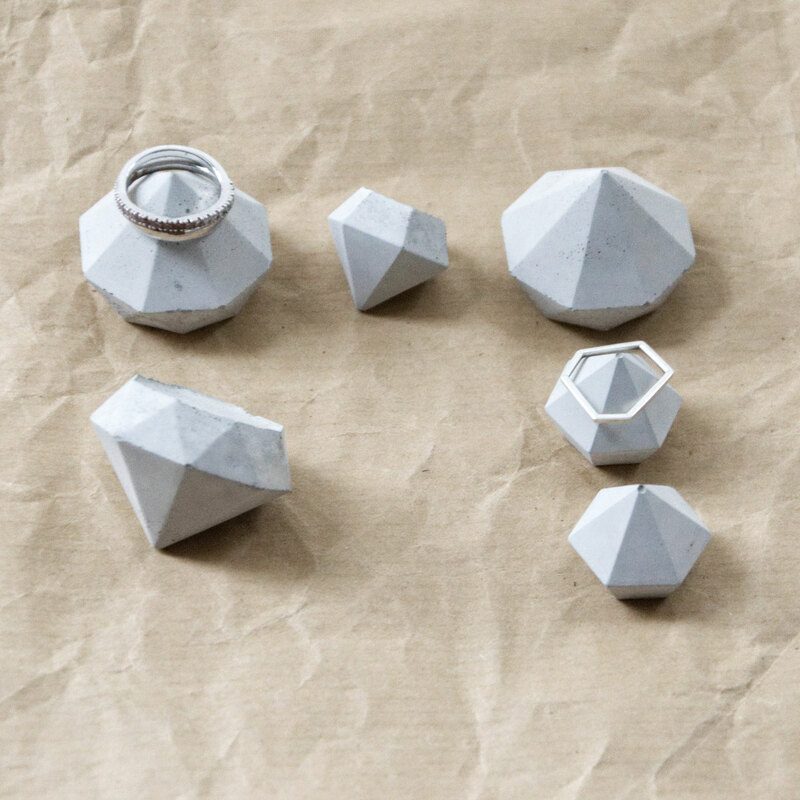 Design: geometric minimal; each size features a different design; individually hand cast. 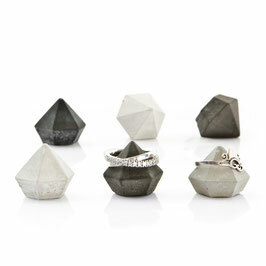 A modern geometric concrete diamond could be just about the right fun gem for an anniversary or Valentine's Day. 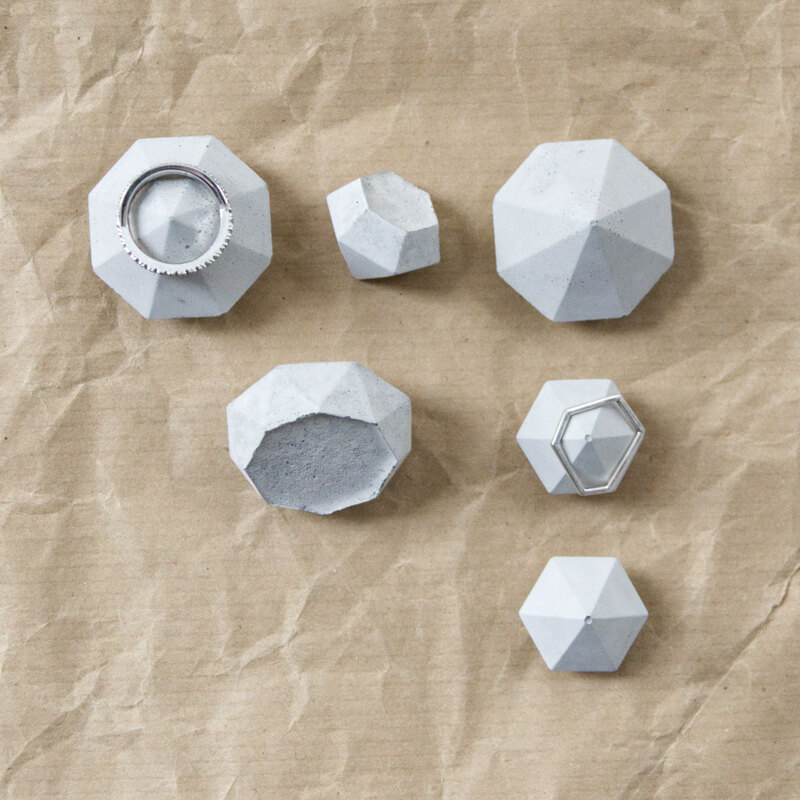 It is often gifted as a well received thank you present or wedding party favour. Feel invited to customise the ribbon and it comes complimentary gift wrapped. 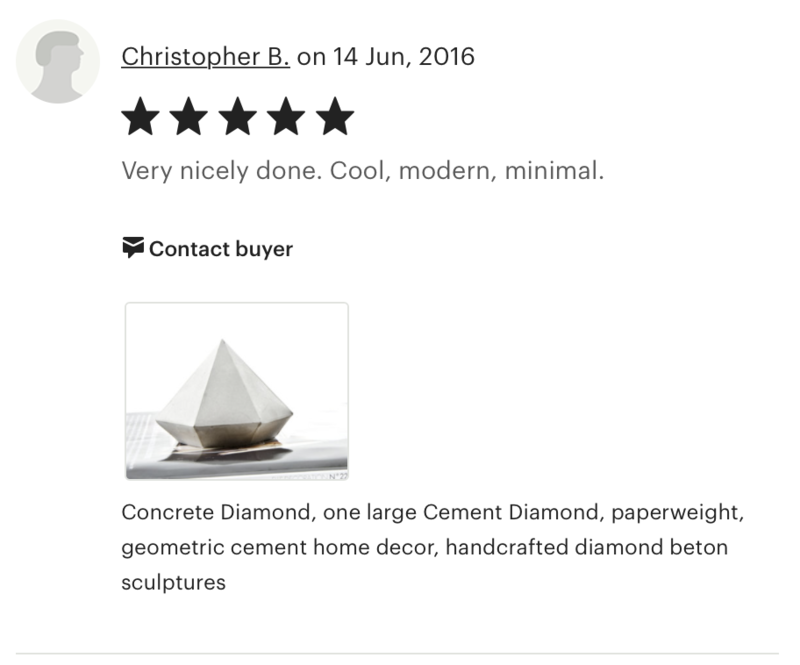 A little tip ... more designs are above and below, enjoy! Customized message on the ribbon: LOVE || SHINE || BE MINE || THANK YOU :) || THANK YOU || KISSES || XOXO || - but it is really up to you. Please make a note of your word/date during checkout in the 'note to PASiNGA box'. 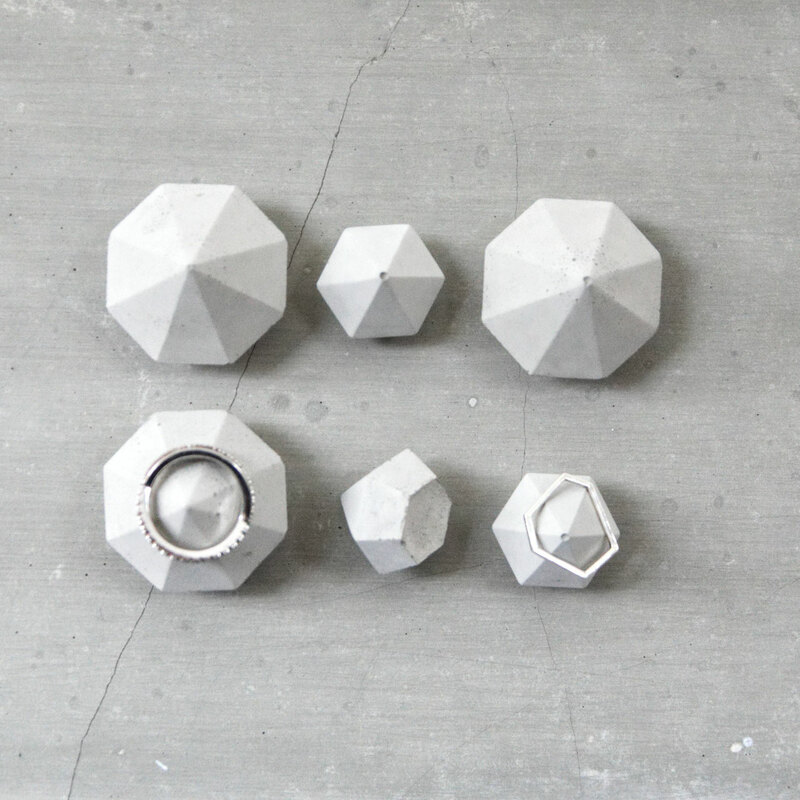 Concrete diamonds are not just a wonderful modern geometric valentines or wedding gift but also a cute desk accessory. Customise the ribbon to make it even more special. It comes, of course complimentary gift wrapped and you can even add a personal note during checkout. Ribbon color: black or red -- Customise the message on the ribbon, it is up to you but some options are suggested below! 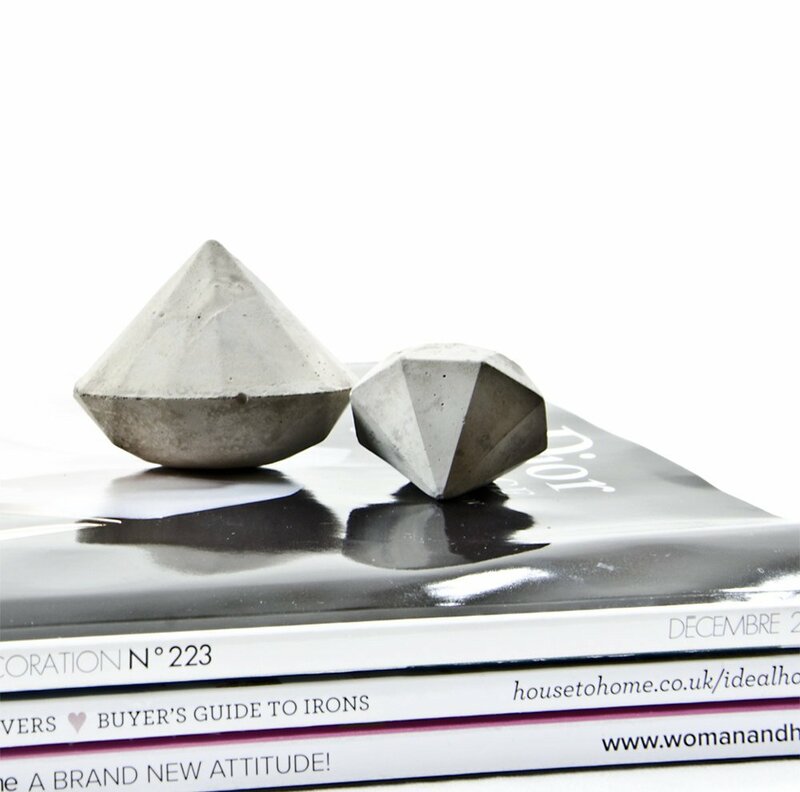 Large pale grey concrete diamond featuring the black ribbon 'Blingin' makes a great gift and can be placed on its own, between books or on your art shelf. 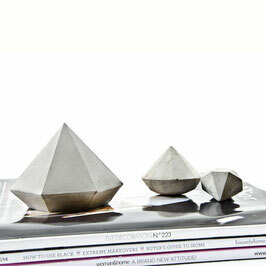 The minimal geometric design also makes a perfect paper weight or jewellery holder. Approx. size: H7 x W10 x D10cm. 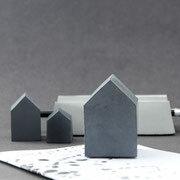 Colour: mid to pale grey concrete. Ribbon: black ribbon with 'BLINGIN' or customised message on the ribbon: LOVE || SHINE || BE MINE || THANK YOU :) || THANK YOU || KISSES || XOXO || - but it is really up to you. Please make a note of your word/date during checkout in the 'note to seller box'. 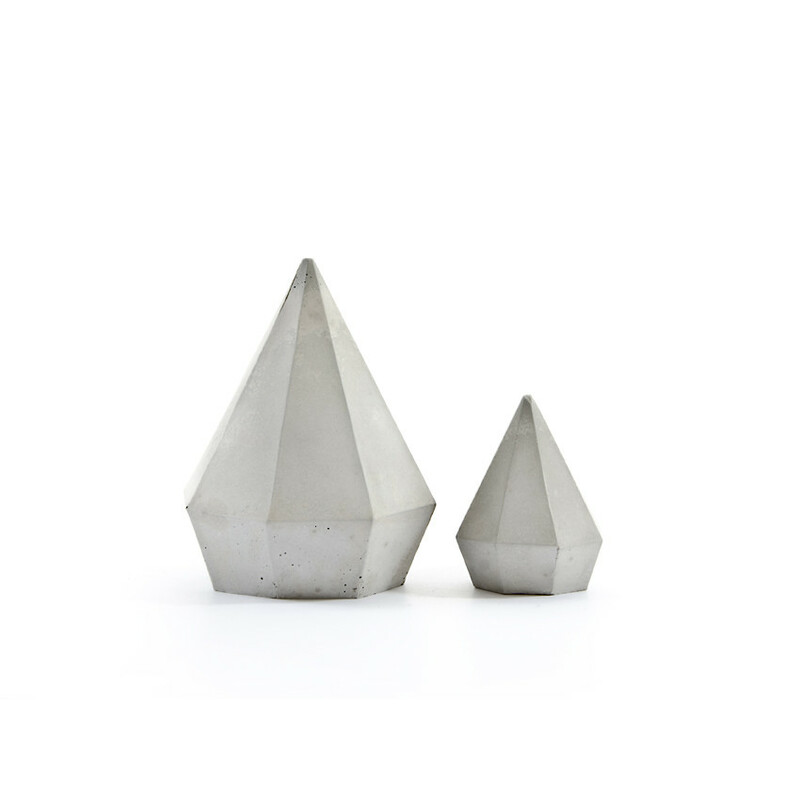 This wonderful set of three concrete diamond sculptures features three shapes and three sizes of concrete diamonds. The largest one is a wonderful paperweight and also the one which will carry the customisable ribbon. 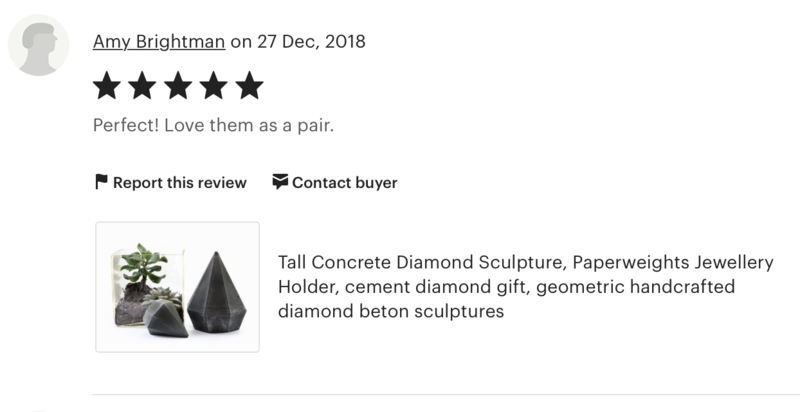 It is a very laid back sculpture set which could be an office accent, just right for your night stand or bedside table and is often utilised as jewellery holders. Just have a look above to be inspired by more. This set also comes with complimentary gift wrap and you are invited to leave a personal message to the recipient during checkout. psst... more designs and finishes are above, enjoy! 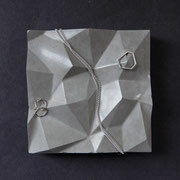 Ribbon: black ribbon with 'YOU ARE A GEM'. Customized message on the ribbon: LOVE || SHINE || BE MINE || THANK YOU :) || THANK YOU || KISSES || XOXO || - but it is really up to you. Please make a note of your word/date during checkout in the 'note to seller box'.